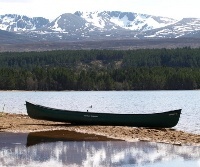 The Cairngorms National Park offers a great range of tourist and holiday destinations from Aviemore to Tomintoul, the highest village in the Highlands. There are many activities in the National Park including skiing, walking and mountain biking. 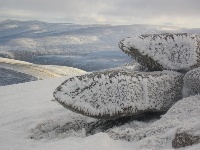 The Cairngorms National Park became the UK’s second National Park in 2003. The area covers 3800sq kilometres, which is 40% larger than the Lake District and twice the size of Loch Lomond and the Trossachs National Park. It offers an ideal holiday destination to enjoy the outdoors, and appreciate beautiful plant and wildlife. The park is home to 4 of Scotland’s 5 highest mountains; Ben Macdhui (1309 m), Cairn Gorm (1245 m), Braeriach (1296 m) and Cairn Toul (1293 m). The area is vastly mountainous with 52 summits over 900 metres above sea level. The land above 600 metres, known as the ‘montane zone’ is the largest area of arctic mountain landscape in the British Isles, making the Cairngorms National Park an area of arctic wilderness. Much of the park is designated as of importance to Scottish and European natural heritage, containing original Caledonian pine forests and a rare pinewood found only in Scotland and Norway. It provides a harsh habitat for unique vegetation, insects and wildlife. 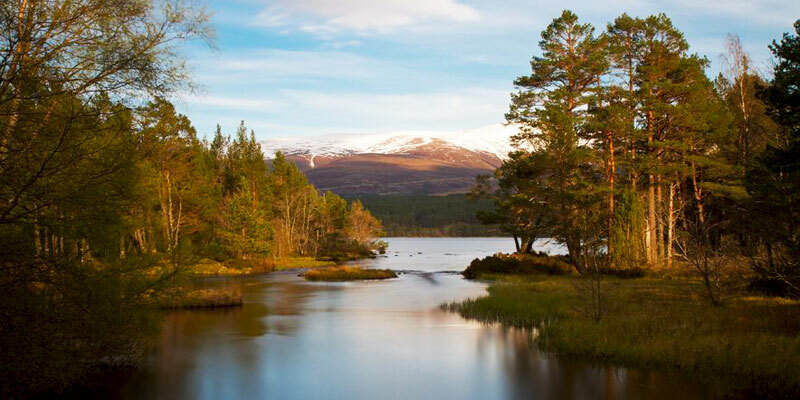 The Cairngorm National Park is home to a wide variety of animals, including pine marten, red squirrels, badgers, wildcat, water vole and otters as well as a rising population of salmon, trout, rare lampreys and endangered freshwater pearl mussels. 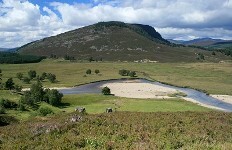 The population density within the Cairngorms National Park is very low. Major towns and villages include Aviemore, Ballater, Braemar, Grantown-on-Spey, Kingussie, Newtonmore and Tomintoul. The National Park and local towns are well established for tourism, accommodation and outdoor activities drawing tourists from around the world to enjoy Scottish skiing, walking, fishing, shooting and stalking. Featured in Scotland on Film, the Cairngorms National Park has provided a unique film location for its captivating natural beauty, most recently, providing a location for stuntmen parachutists in the movie The Dark Knight Rises (2012) at Feshie Bridge.